Yeng Guiao with Gilas players. MANILA, Philippines — PBA commissioner Willie Marcial and board chair Ricky Vargas led the PBA delegation that flew yesterday to Doha, Qatar where they will lead Qatar-based Filipino overseas workers who will root for Team Phl in its quest for a berth in the 2019 FIBA World Cup. 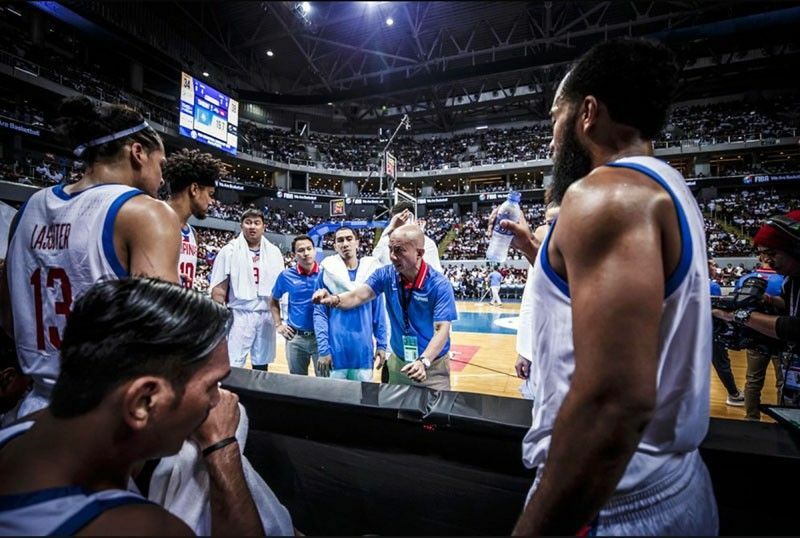 “I have talked to coach Yeng Guiao, and he is confident we can win and make the World Cup. And I believe him,” said Marcial. All the members of the PBA board, except Magnolia’s Rene Pardo, are with the group to provide morale support to Gilas Pilipinas as it tangles with Qatar Thursday in Doha then with Kazakhstan Sunday in Astana. “We all know that the team is made up of PBA players. So the entire board is flying to Qatar to support the team. We all know in the board how important these two games are for us. We want to win these games,” said Al Panlilio, Meralco’s representative to the PBA board and also the president of the Samahang Basketbol ng Pilipinas. The Nationals and the Qataris square off at the Al-Gharafa Sports Club Multi-Purpose Hall in the Qatari capital. The venue may well look like a home court for Team Phl with the Filipino community expected to come and support the Nationals. Twelve PBA players make the team with Blatche and Gilas cadet Thirdy Ravena. The PBA players are June Mar Fajardo, Japeth Aguilar, Poy Erram, Raymond Almazan, Troy Rosario, RR Pogoy, Marcio Lassiter, Gabe Norwood, Paul Lee, Scottie Thompson, Mark Barroca and Jayson Castro.